Competitive racing has been present in some form at Lagoon since it opened in its current location in 1896. Even earlier than that, Lake Park (Lagoon’s predecessor) held boat races on the Great Salt Lake. In the early days, Lagoon served as a starting point and finishing line for many races on foot and bicycle. 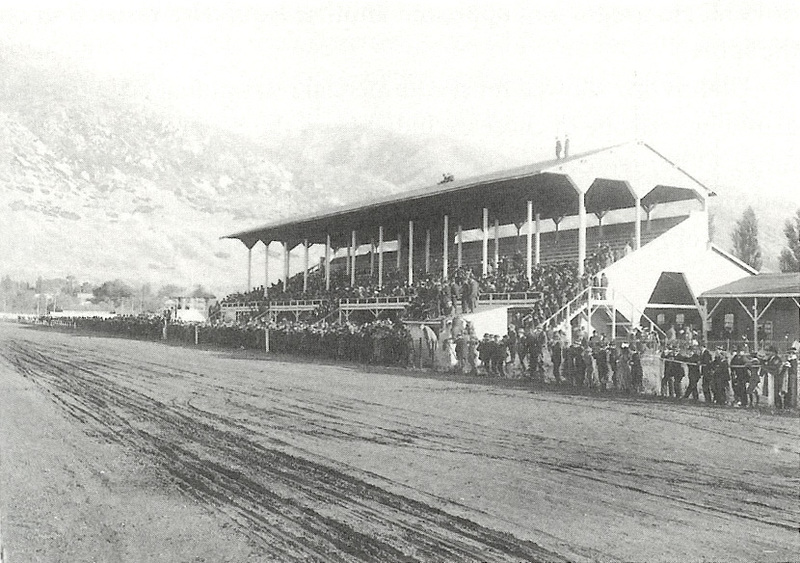 Horse racing was a big draw in Utah when Lagoon opened a new race track in 1911. But after only two years, the races were outlawed. It wasn’t until 1925 when horse racing was allowed again using the pari-mutuel betting. But even that only lasted until 1927. Spectators on 11 October 1914 during a race between automobile driver Barney Oldfield and airplane pilot Lincoln Beachy. From the book A History Of Davis County. 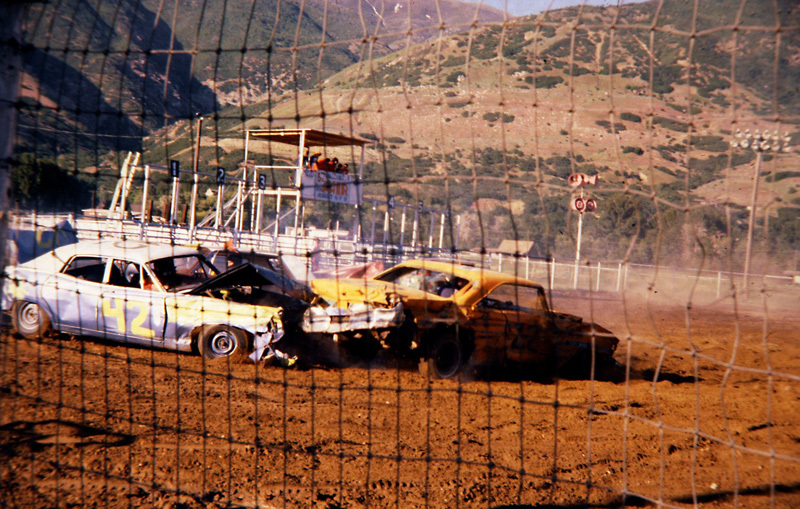 Auto races then became the new thrill in racing and a variety of races were held at Lagoon. After the initial Davis County Fair took place at Lagoon in 1906, it eventually became an annual event from 1929 to 1942. During World War II, Lagoon closed indefinitely and the county fair moved to Kaysville. In the early 1960s, Lagoon was thinking seriously about expanding and bringing in a wider variety of entertainment. One part of their long-term plans including stock car races on the old track. Even though their proposal was approved by the Farmington City Council, the backlash from local residents was enough to cause Lagoon to withdraw. The Davis County Fair returned to Lagoon in 1966. Lagoon constructed new buildings to accommodate the fair and other events including the Davis Pavilion and Davis Stadium (later known as Lagoon Stadium). The stadium would become home to weekly rodeos and demolition derbies until the early ’80s. It was after the 1984 county fair that it relocated once more, allowing Lagoon to expand onto the land utilized by the fair. The Midway was extended northward in 1986 with Flying Carpet placed at the far end (where Samurai stands today). A few concerts were held at the stadium in the late ’80s, but the venue was used less and less. The concrete grandstand still stood when Top Eliminator was installed on what used to be the race track’s home stretch. These controlled dragster rides were the first to let park guests compete against each other on such a large scale. The grandstand was demolished around 1998 and Double Thunder Raceway, featuring two go-cart tracks, opened in its place in 2000. Top Eliminator closed for good in 2011 to make room for a record-breaking new roller coaster, Cannibal. The tradition of racing at Lagoon still continues in 2015. The first foot race in decades, a half marathon/10k/5k was held on April 3rd with the final leg of the race winding around Lagoon’s rides. Lagoon Speed Carnival newspaper ad. Deseret News, 3 Sep 1920. Unknown Vandals Attempt To Wreck Big Racing Cars. Deseret News, 6 Sep 1920. Blodgett, Gary. Auto Racing At Lagoon?. Deseret News, 1 Oct 1964. Racing Opponents Prepare Petitions. Deseret News, 12 Oct 1964. Blodgett, Gary. No Lagoon Racing. Deseret News, 13 Oct 1964. Hess, Margaret Steed. My Farmington: A History Of Farmington, Utah: 1847-1976. Helen Mar Miller Camp, Farmington, Utah, 1976. Westergren, Bruce N. Utah’s Gamble with Pari-mutuel Betting in the Early Twentieth Century. Utah Historical Quarterly 57, number 1, page 4. Winter 1989. Previous PostRecent Updates: Hand Cars & MoreNext PostLive At Lagoon, 1962!